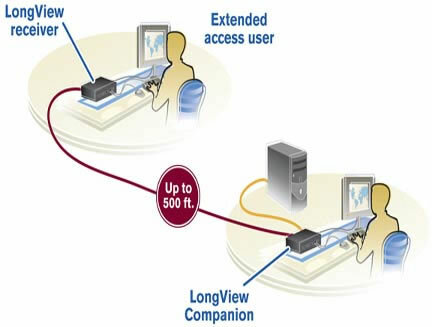 The Avocent LongView Companion (LV830-AM) extender allows a second user station to be located near the computer. You can place connected computers up to 500 feet away with any CAT 5 cable and still have control of your keyboard, monitor, mouse, speakers, microphone and serial devices. The Avocent LongView extension technology improves physical and data security and increases workspace by separating your staff from their computers. Companion mode supports a second user connection locally at the target device. Secure location placement minimizes tampering, system damage and unauthorized software installation on computers. AutoTuning technology automatically compensates for signal loss, delivering clear, crisp video images up to 500 feet at a resolution of 1024x768. Environment--Reduce downtime by removing the computer from an environment not suitable for normal and reliable operation. Save space--Move your computer away from the desk and work area to free up valuable desktop space. Installation ease--The single cable-to-desk design simplifies installation while making it easier for you to move, add or change configurations. Security--Place your system unit, software and sensitive data in a secure area to minimize tampering, system damage and unauthorized software installation. Question: Do you offer repair or exchange services for this product? If you would like to purchase a replacement unit or investigate other solutions, please give us a call at 1-877-586-6654. Question: Will LV830-AM work with Cat 6 shielded? Further on, under Appendix G: CAT 5 Cable the manual adds, 'If the cable you intend to use is CAT 5 or an enhanced version of CAT 5 (5E or 6 for example), then the cable's characteristics should be generally acceptable. LongView extender's video tuning for distance depends upon the cable's loss characteristics and the twist rates. The twist rates vary from pair-to-pair in a cable in order to reduce crosstalk. Different cable vendors do not use the same twist rates nor do they put the twist rates in the same order on the four pair. 'Better' cable does not necessarily result in better LongView extender performance because the LongView extender was not designed for that particular cable. For additional information, the manual can be found here: http://www.42u.com/pdf/Avocetn-lnvx30-manual.pdf. Question: What do you offer that will allow two monitors to be extended along with USB, Keyboard and mouse? Answer: Thank you for your inquiry. There several dual monitor KVM extenders out there. One such extender is the Adder X50-MS2. Additional dual-monitor extenders can be found on the following page: https://www.kvm-switches-online.com/dual-head-kvm-switch.html. The main category is dual-monitor KVM (keyboard, video, mouse) switches for more than one computer, but a number of the devices listed on the page are simple dual-monitor extenders. Question: Can I use my lv830-am with the LV3010P-001 or the dual option? LV3010P transmitter and receiver units are not interchangeable with legacy LV LongView infrastructure. The LV830-AM series was replaced by the Avocent LV3000 series; Alternatively, you may also be interested in the very similar Adder X2-DA-GOLD or Adder X-USBPRO-MS2 (note, USB).